Anacharsis in English  Anything But Dry! (Imaginary Travels/Voyages). [Barthelemy, Jean-Jacques]. Travels of Anacharsis the younger in Greece. During the middle of the fourth century, before the Christian æra.... The first American edition. Philadelphia: Pr. by Bartholomew Graves and William McLaughlin for Jacob Johnson & Co., 1804. 8vo signed in 4s (22 cm, 8.625"). Vol. I: xviii, 419, [1 (blank)] pp. ; fold. map; II:  f., iii, [1 (blank)], 403, [1 (blank)] pp. ; III: vii, [1 (blank)], 463, [1 (blank)] pp. (lacking half-title); IV: vii, [1 (blank)], 496 pp. (lacking half-title). An AFRICAN Utopia, as Described to the INQUISITION (Imaginary Travels/Voyages). [Berington, Simon]. The adventures of Signor Gaudencio di Lucca. Being the substance of his examination before the fathers of the Inquisition at Bologna, in Italy: Giving an account of an unknown country in the midst of the deserts of Africa, the origin and antiquity of the people, their religion, customs, and laws. Copied from the original manuscript in St. Mark’s Library, at Venice. With critical notes by the learned Signor Rhedi. To which is prefixed, a letter of the secretary of the Inquisition, shewing the reasons of Signor Gaudentio's being apprehended, and the manner of it. Translated from the Italian. 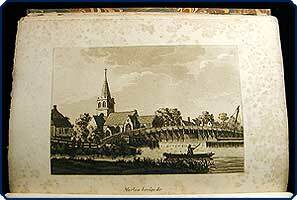 Philadelphia: Re-printed by William Conover, 1799. 12mo (18 cm; 7.125"). 320 pp. The Inquisition  An African Utopia  Educating Women (Imaginary Travels/Voyages). [Berington, Simon]. The adventures of Signor Gaudentio di Lucca. Being the substance of his examination before the fathers of the Inquisition, at Bologna, in Italy. Giving an account of an unknown country in the midst of the desarts [sic] of Africa. Copied from the original manuscript in St. Mark’s Library, at Venice. With critical notes by the learned Signor Rhedi. Baltimore: Pr. by Bonsal & Niles, 1800. 16mo (17 cm; 6.5"). xxi, , 24–234 pp. Institutionally Approved as a Virtuous Juvenile Reading Book (Imaginary Travels/Voyages). Cardell, William S. Story of Jack Halyard, the sailor boy: or, the virtuous family. Philadelphia: Stereotyped by L. Johnson for Uriah Hunt, 1832. 24mo (14.5 cm; 5.75"). Frontis., 234, 8 (ads for Uriah Hunt) pp. ; illus. Star-Crossed Italian Lovers — Peregrino & Genevera (Imaginary Travels/Voyages). Caviceo, Jacopo. Il peregrino. Vinegia: Pietro di Nicolini da Sabbio, 1538. 8vo (15 cm, 5.9"). pp., 271, [1 (blank)] ff. ; illus. Tilting at Windmills, Protecting Dulcinea, & Flying to the MOON (Imaginary Travels/Voyages). Cervantes Saavedra, Miguel de. Primera parte del ingenioso hidalgo don Qvixote de la Mancha. En Brucelas: Por Huberto Antonio, 1617. 8vo ( 16.8 cm; 6.625"). ff., 583,  p.,  ff. (one leaf in facsimile). The Last (First?) 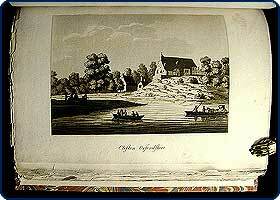 Appearance of Captain Tom Lingard (Imaginary Travels/Voyages). Conrad, Joseph. The rescue a romance of the shallows. Garden City & New York: Doubleday, Page & Co., 1920. 8vo (19.4 cm, 7.6"). , 404,  pp. (Imaginary Travels/Voyages). Defoe, Daniel. The life and strange surprizing adventures of Robinson Crusoe, of York, mariner. 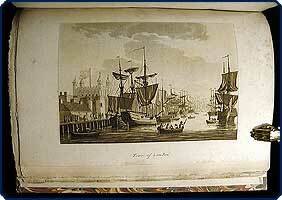 London: John Stockdale, 1790. 8vo (22 cm, 8.7"). 2 vols. I: Frontis., engr. t.-p., xii, 389,  pp. ; 8 plts. II: Frontis., engr. t.-p., [iii]–v, , 456, [14 (adv.)] pp. ; 5 plts. Dropmore Press — Unopened Copy (Imaginary Travels/Voyages). De Quincey, Thomas. Revolt of the Tartars or flight of the Kalmuck Khan and his people from the Russian territories to the frontiers of China. London: Dropmore Press, Ltd., 1948. 4to (26.8 cm, 10.6"). , 96,  pp. ; illus. A Counterfeit Edition / A Sophisticated Copy / A FANTASTIC STORY (Imaginary Travels/Voyages). Enríquez Gómez, Antonio. El siglo pitagorico, y Vida de don Gregorio Guadañia. [Spain]: publisher not identified, [1682; really ca. 1699]. 4to (20 cm; 8). ff., 292 [i.e., 308] pp. Adventures, Misadventures, TWO LIONS, & a Dead Turkish Prince (Imaginary Travels/Voyages). The famous history of the valiant London 'prentice. [Nottinhgam]: Printed for the honourable Company of Walking Stationers, [ca. 1790]. 16mo (15.5 cm, 6"). 24 pp. ; illus. Expanding the Imagination & Bringing Science to the Masses (Imaginary Travels/Voyages). [Heinlein, Robert; Urusula LeGuin; Isaac Asimov; Harry Harrison; & many others]. Large collection of science fiction & fantasy. Various places: Various publishers, ca. 1952–2000. 12mos. Approx. 500 vols. (some dupes). Homer in Greek, Using Proctor's Type (Imaginary Travels/Voyages). [Homer (Homerus)]. [one line in Greek, transliterated as] Homēri Odysseia. Oxford: Pr. at the University Press, 1909. Tall 4to (29 cm, 11.5"). [4 (3 blank)], , [3 (blank)] ff. The Importance of “Goods Which Cannot Be Taken” When You Die (Imaginary Travels/Voyages). [Hughes, John, & John Arbuthnot]. Charon; or, the ferry-boat. A vision. Dedicated to the Swiss Count —. 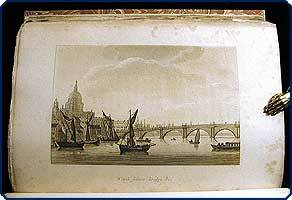 London: printed; and sold by W. Lewis near Covent-Garden, J. Brotherton and W. Meadows at the Black-Bull in Cornhill, J. Roberts in Warwick-Lane, and A. Dodd at the Peacock without Temple-Bar, 1719. 8vo (18.8 cm; 7.375"). , 26 pp. Up the THAMES in a Rowboat (Imaginary Voyage). Jerome, Jerome K. Three men in a boat to say nothing of the dog! Ipswich: Pr. by W.S. Cowell Ltd. for the members of the Limited Editions Club, 1975. Oblong 8vo (23.6 cm, 9.3"). xv, , 174,  pp. ; 12 col. plts., 2 double-p. col. plts. The Baron with Hand-Colored Plates (Imaginary Travels/Voyages). [Raspe, Rudolf Erich]; Alfred Crowquill [pseud. of Alfred Henry Forrester], illus. The travels and surprising adventures of Baron Munchausen. New York: James Miller, 1864. 12mo (17.7 cm, 7"). Col. frontis., col. t.-p., 251,  pp. ; 8 col. plts., illus. 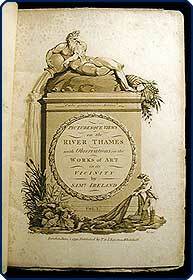 The Illustrator's Copy (Imaginary Travels/Voyages). Raspe, Rudolph, et al. ; John Carswell, intro. ; Fritz Kredel, illus. The singular adventures of Baron Munchausen. New York: For the members of the Limited Editions Club, 1952. Small 4to (24.8 cm, 9.75"). xli, , 175,  pp. ; illus. In a Manner of Which You Can Scarce Have a Notion” (Imaginary Travels/Voyages). (Robinsonade — Not Defoe, Daniel). Robinson Crusoe: With thirty illustrations. London: Wm. S. Orr & Co. (pr. by Vizetelly Brothers & Co.), [ca. 1843]. 16mo (17 cm, 6.45"). Frontis., , 39,  pp. ; 8 plts., illus. From Calais to the Bourbonnois with Sterne & Leloir (Imaginary Travels/Voyages). Sterne, Laurence; Maurice Leloir, illus. A sentimental journey through France and Italy. New York: J.W. Bouton, 1884. Folio (31.1 cm, 12.25"). Add. col. t.-p., xvi, 210,  pp. ; 12 plts., illus. Illustrations by Benson Lossing, William Howland, & “HH” (Imaginary Travels/Voyages). The young sailor; or the sea-life of Tom Bowline. New York: Kiggins & Kellogg, 123 & 125 William St., [1856–66]. 32mo (11.5 cm, 4.5"). 16 pp. ; illus. [Justel, Henri, ed.]. Recueil de divers voyages faits en Afrique et en l’Amerique, qui n’ont point esté encore publiez.... Paris: Louis Billaine, 1674. 4to (23.7 cm, 9.4"). á4ã4A–Z4Aa–Hh4 Ii2Kk4Ll21§–4§45§2 **A–**C4 a2b–g4 *A–*K4L2;  ff., 262, 35, [1 (blank)] 23, [1 (blank)], 49, [1 (blank)] pp.,  f., 81, [1 (blank)] pp., 3 fold. plans, 4 maps (3 fold. ), 9 plts.